ARLINGTON, Minn. – Snapshots fill Justin Josey’s mind every time he competes. The images are clear, whether they’re of a bull’s horn missing his leg by millimeters or the animal’s neck brushing against his side as it whisks past. They’re what drive the young man, who will be one of five that will be part of the Bullfighters Only tour stop in conjunction with the Pro Auto NYA Bull Riding event. “It’s the pictures in my head that I have when I’m fighting a bull,” said Josey, 21, of Apache, Okla. “It’s slow motion to me. I have those pictures, and the rest is kind of a blur. The Arlington stop is part of a fundraiser for the charity of retired NFL player Jared Allen, Homes for Wounded Warriors. The organization helps to build handicapped assessable homes for wounded soldiers that have served in Afghanistan and Iraq. It’s worked. Now preparing for its fourth year, the event has raised tens of thousands of dollars for Homes for Wounded Warriors through portions of ticket sales and through nightly live auctions. This year he wanted to add to the bull riding, so he sought out the men from Bullfighters Only to add to the flavor of the event. Just as the events in Arlington are to raise money for a good cause, Bullfighters Only has created public demand for the sport. The bullfighters utilize their tremendous athleticism to try to outwit and outmaneuver equally athletic bulls, which are bred specifically for this type of fight. “It’s a really good movement that we have, especially considering it’s been more than 15 years since the Wrangler Bullfights were popular,” Josey said. “Being part of something that’s affecting change so positively is really cool. Thinking about the things you are doing for freestyle bullfighting is a great thing. It’s humbling and exhausting at the same time, but it’s always great. It’s a beautiful dance in the arena dirt filled with danger and dramatic movements. 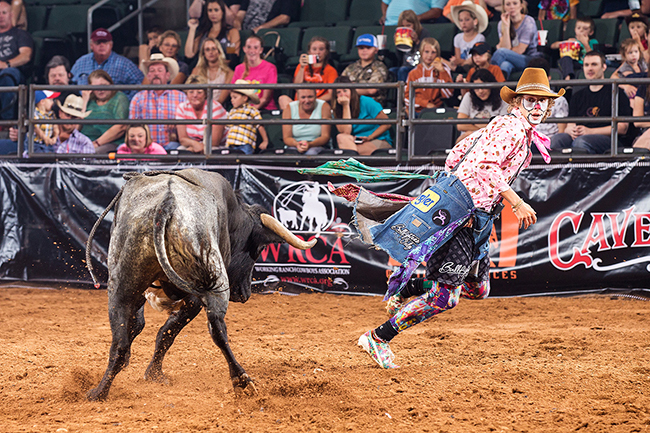 “We all love freestyling bulls, and that’s why we do it,” Josey said. That love affair has carried over into Bullfighters Only, which is now closing out its inaugural season of breathtaking competition. “You can see how far it’s come in a short time,” he said. “I think the most exciting aspect of this is the transformation of freestyle bullfighting. That’s something that Josey hopes for his own career, which began just three years ago. He learned about bullfighting in the summer of 2013 when he served as a driver and helper for rodeo clown Justin Rumford. Shortly thereafter, Josey began the work needed to be one of the best in the game. Those are the snapshots Justin Josey sees. That’s what drives him and pushes him, and he hopes to pass that down to the next generation. After all, that’s a big part of what Bullfighters Only is all about.